Zhang Yongming (1956 – 2013) was a serial killer from China, the Yunnan Province. 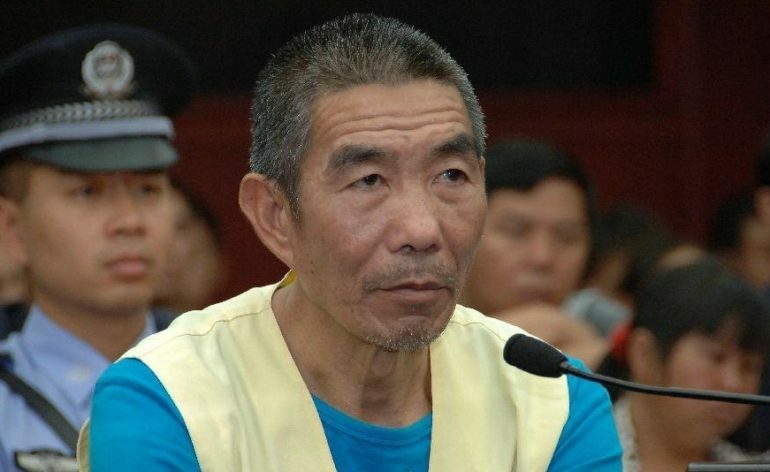 Zhang confessed and was convicted of the murder of 11 men in the span of four years. The killings happened between March 2008 and April 2012. He would feed parts of his murder victims to dogs and actually sold other parts of his victims at the local market for humans to eat, claiming that it was “ostrich meat”. China’s News Agency “Xinhua”, (a state run news agency) broadcast that Zhang was “escorted to an execution site and executed” on January 10, 2013. Little is known about Zhang as a child, and his early life. We do know that he was actually arrested and sentenced to death in 1979 for homicide. Unfortunately, Zhang was released in September 1997 as china reduced multiple sentences this year, his included. Upon his release, he was given some land and was allowed to live out the rest of his life there…if he hadn’t reoffended. In 2012, the government sent investigators to his provenance in China as there were reports of missing teenager in the area. One of the teenagers was known to have been killed, suspected murdered, but the others at the time were only missing person cases. The investigators discovered that an unidentified male was attacking and killing teenage males near Zhang’s home since 2008. Other individuals in the village said they believed that they had seen plastic bags hanging outside his home, with possible bones hanging out of the bags. When the police used this information to enter his home, police discovered all kinds of grotesque things, such as human eyeballs preserved in bottles and drying human flesh around the house. It was reported that throughout the entire trial Zhang didn’t show any remorse and refused to apologise to any of his victims’ families, both during the trial, and during his incarceration. Twelve police officers who worked in the provenance were dismissed for not doing their duty after the trial was over. Missing the signs and failing to help the teenage boys for four years whilst Zhang was killing.